Agios Gerasimos is the protector saint of Kefalonia. He was known for his miraculous abilities to cure people with mental illnesses. His miracles which became widely known across the country, led to the removal of his relics that were found totally incorrupt. Today, his relics are saved in double glass reliquary placed above the saint’s tomb. The monastery is situated under the imposing Mount Ainos and near the villages of Fragata and Valsamata. Today the monastery has been reconstructed. It is an imposing building with a newly built church. Beneath the monastery there is a cave with two rooms which used to be the home of the Saint. The only way to access this cave is by a large hole. 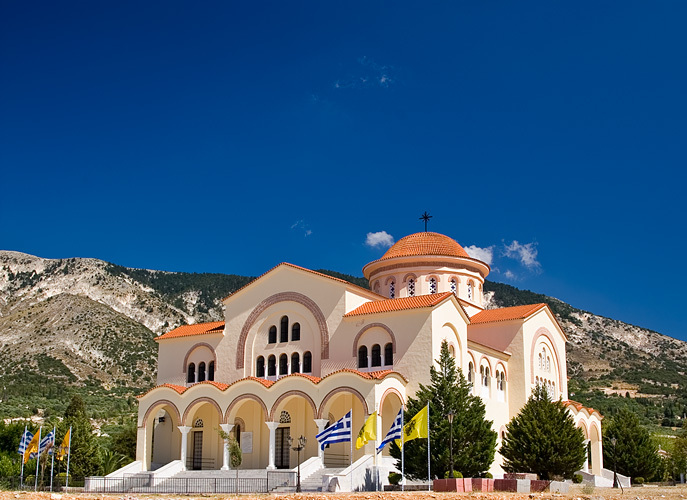 The monastery is considered one of the most sacred pilgrimages in Kefalonia hosting a great number of visitors. A small church to Agios Gerasimos has been built above the tomb and the cave of the saint. The Saint also had planted a plane tree which is still preserved at the monastery. On his feast day, August 16th, there is a grand litany for the commemoration of the saint’s death in which his sarcophagus is paraded and laid under the plane.